Sorry for being MIA this past week.. But my Family and I are taking a little, very much needed break, and enjoying every minute of it! So.. if things seem a bit slow around these parts, you know why :) Till Then I leave you with this sweet, hard working, little country babe.!! I could just pinch those little apple cheeks all day! 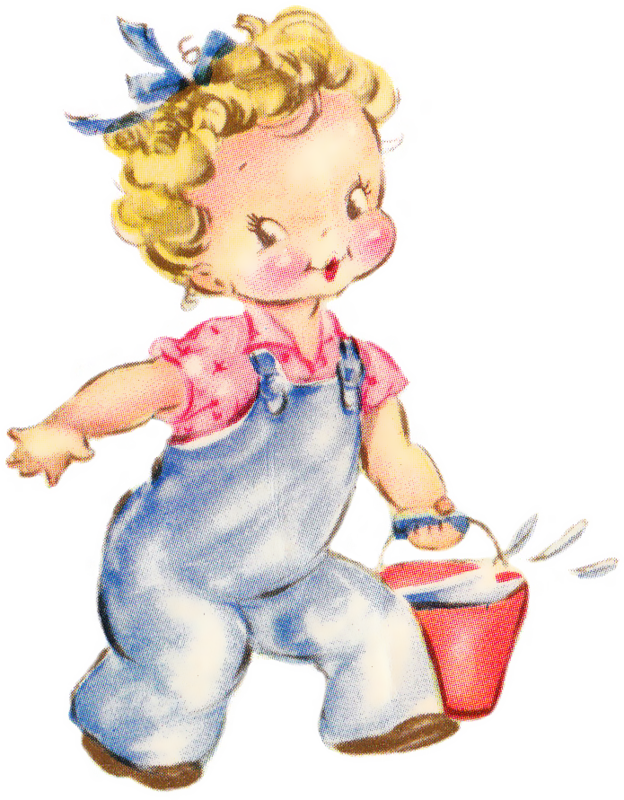 I wish I could look this Cute in Overalls! Oh my goodness! I think this is the best and cutest vintage clipart ever!!! I’m grinning from ear to ear right now. Thank you SO much for sharing. Adorable! Good for you for taking a respite with the family! The creatives I admire most are those that put family and real life ahead of their life online. Thank you for the wonderful graphic!! I’ll be you do look that cute in overalls! You just rest up and enjoy your break. You so deserve it! I’m working on Ariel’s quilt today!!! I needed a break from working on the new room. awww my dear, I cant WAIT to see it!!!!! EEEPPP!! awww, what a QTPie. Enjoy your down time! Wow! Very cute … love it! Hi there this is my first time on your blog. Thanks so much for the absolutely adorable clip art. I love the style and see many projects I can make for grandkids using it. I’ll be back to visit to see what’s up very often. Love your blog. And shabby blogs. If I ever need to design something, first thing comes to me in my mind is FPTFY or shabby blogs. Hats off! Thank you for your generosity. Keep those awesome designs and inspiration coming! Love that little girl! Soo cute! Thank you! Blessings and hope you and your family have a fantastic vacation! !